bears | Northwest Navigation Co. The good bears at Pack Creek would like to remind you that a couple minutes of plank every day will help build good strong core muscles. 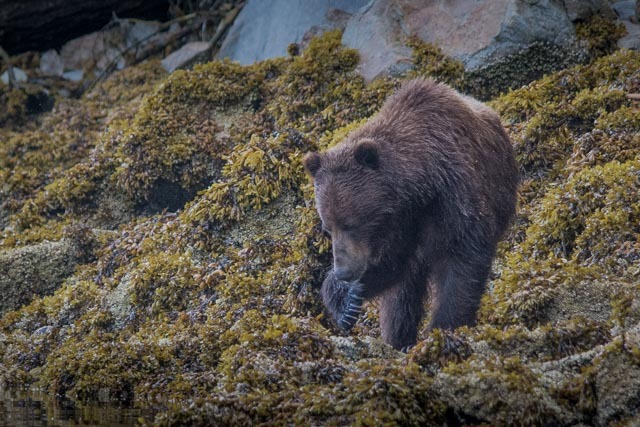 Brown bear at Pack Creek in Alaska. We watched this old bear at Pack Creek on Alaska’s Admiralty Island in the spring. She’s thirtysomething and walks with a deep limp from a broken leg now healed. Her nose was once broken and sits askew. Even as she digs clams with mud clinging to her aged fur, I can’t help but think she’s the most beautiful animal I’ve ever seen. We tried something new — Facebook Live! Jeffrey and I thought it would be fun to see what it was like to do a Facebook Live Chat so we could talk about what we do on the David B, where we go, and to answer questions about what our trips are like. It turned out to be a blast. We were joined by lots of familiar people as well as new people. Not only did we get to talk about one of my favorite bear experiences from as summer, but we also got to answer questions about our trips and drinks with glacier ice. Below is a link to our YouTube account that has the conversation. I hope you enjoy it and stay tuned for more Facebook Live Chats. And if you haven’t had a chance to follow the David B on Facebook, here’s a link. When we enter Nettle Basin on our Southbound Inside Passage cruise between Ketchikan and Bellingham, we always hope we’ll find bears at Verney Falls. In mid-August the salmon come home to spawn here and the bears come for the feast. Nettle Basin, at the base of the falls will be alive with hundreds of splashing salmon. Sometimes we’ll kayak right up to the waterfall to watch eagles, ravens, and bears feeding on the salmon. It’s exciting to watch bears fishing but I’ve often found myself more mesmerized by the great schools of salmon that gather in the pool at the base of the waterfall. When they jump, it sends a splash of water on to me and my kayak and as they swim their fins cut the surface like sharks. There’s a lot of energy packed into in this small space. It’s nature’s raw energy of life and survival. I find myself rooting for both the fish and the bears, and I root for the eagles and the ravens too. It’s easy to get caught up in the drama at the waterfall, it’s why we like to come here. 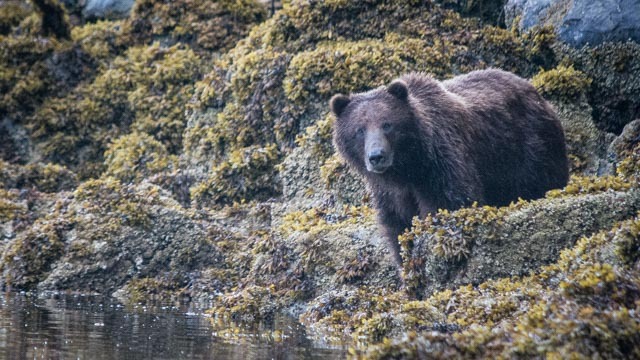 When people ask what I do for a living, I respond that Jeffrey and I run a tour boat in Alaska, and if that leads to a longer conversation, I usually continue on about how we spend lots of time watching humpback and orca whales, and how we have a couple of spotting scopes on the boat so we can watch bears forage on the beach. Rarely do I run on about how much I love watching crows and other common animals. This is partly because, like weeds, the virtues of crows remain undiscovered for most people. I find crows fascinating. They help me fulfill my need for nature during the off-season at my urban home where there are no deep-wilderness animals to geek-out on. Sometimes the crows tell me what’s going on in the neighborhood. Like the time when a raccoon was out wandering during the day. I heard what I like to call a “crowmotion” a few block to the east. The crows were noisily and excitedly moving through yards and alleys. I stepped out the backdoor to see what all the fuss was about. As soon as I opened the door a raccoon came into my yard seeking refuge in a tall cedar tree. Unfortunately for the raccoon, there were already two other raccoons sleeping there and the poor thing was forced to move along. I watched it leave the tree and cross the street. I lost track of the raccoon as it ambled into the neighbor’s yard, but the crows continued their parade “cawing” and flying from tree to tree for several blocks. I’ve learned a lot from observing crows and that with their help, they often lead me to exciting discoveries. One time I was kayaking close to shore in a cove in Alaska. It was a calm overcast day. I was looking for sea stars, crabs, and small schools of fish. I kept my attention focused on the water below my boat. After a while my ears picked up the sound of several crows in the bushes to my left. The crows were going on and on about something. I half listened thinking there was probably an eagle in a tree. I decided to look up. No eagle. I went back to skimming along the surface and searching the shallow water. They crows kept talking. I looked up again and decided to see if I could find the focus of their attention. I held my boat still by gently padding the water with my paddle. I watched. The crows were clustered low on the branches of spruce, hemlock, and alders. I looked at where they were looking. A branch moved. The tide was high and I was maybe 30 feet from the edge of the forest. I held still and smiled to myself as my eyes made out a dark fuzzy round shape with two more fuzzy round shapes on top. The animal was partially blocked by shrubs and very difficult to see. The crows had discovered a brown bear and wanted everyone to know. I had listened. Crows gave away this brown bear’s hidden resting place in the woods. There have been many other times that the cues of common animals have increased my awareness. I’ve watched gulls flying in a straight line, then suddenly circle. Most of the time it’s a fish coming to the surface, but sometimes it’s a whale. One day I realized that I often say things like, “Oh, that’s just a crow”, or, “It’s just a gull,” when really, they are so much more than “just a.” They are communicators and lively participants in the ecosystems and habitats of which we are part. If we pause to listen to them, we might discover they know things that will truly enrich our lives.